Hudson provides enclosure solutions for the oil and gas industry including custom material procurement as well as advising and working with the customer to insure that their expectations are met. Through collaborative design, Hudson is able to make sure the finished product will perform to industry standards in the field. When formulating custom solutions for oil and gas applications, there are multiple challenges to address. The oil and gas industry requires components and equipment made from high performance metals that can withstand environmental and application demands-correct materials must be sourced for fracking and gas extraction applications. Mechanical equipment failures pose product quality issues as well as safety issues for workers. Most companies in the Oil and Gas industry implement their own accurate failure analysis technology on equipment prototypes and finished products ensuring both safety and quality while maintaining efficiency and production. Positive material identification practices reduce the chances of material issues leading to mechanical failures. Custom, deep drawn cylindrical enclosures or our expertise in manufacturing prismatic (rectangular) as well as asymmetrical shaped deep drawn enclosures. High performance metals such as various grades of titanium and stainless steel. Material sourcing through custom solutions. Implementing stocking programs and buying raw materials efficiently. Solutions for design, cost-effectiveness, and manufacturability. Little to no tooling charges for our catalog’s more than 15,000 shapes and sizes. Project management: our team works with you throughout every step of the process to ensure smooth launches for new programs. Green manufacturing: our manufacturing processes do not produce any hazardous waste. AS9100D certified , ISO 14001:2004, and ISO 13485:2003 compliant. Hudson Technologies continues to make investments in the new technologies required to meet the ever-increasing demands of our customers and the industries we serve. Recently, we’ve upgraded productivity with the addition of a five-axis cutting laser and eight robotic arms. We’ve also added a Platarg transfer press which has given us increased capacity with faster and more efficient production runs. 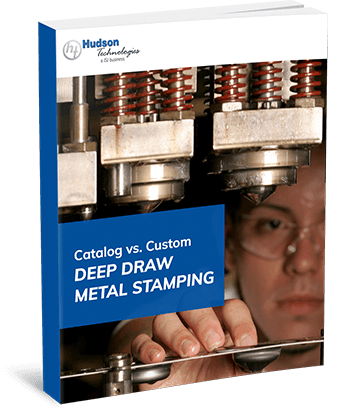 Hudson Technologies’ custom metal stamping solutions are designed for efficiency and high performance in the oil and gas industries. To discuss your custom oil and gas requirements, contact us today. Hudson Technologies houses machines built to meet your specific needs.